Danny O’Brien’s strengthened his hand in this year’s Newmarket Handiap with the effortless first-up victory by Shamexpress last night at Moonee Valley. Shamexpress will join stablemate Adamantium, impressive winner of the Standish Handicap at Flemington earlier in the month, in the $1 million race at Flemington on March 9. O’Brien said Shamexpress, placed behind Nechita in the Group 1 Coolmore Stud Stakes at Flemington on Derby Day, is likely to head to the Black Caviar Lightning Stakes (1000 m) at Flemington on February 16. He said the Newmarket Handicap would well suit Shamexpress, who has been backed from as much as $81 into $41 for the Group 1 race. The colt gave Glen Boss an arm-chair ride as he camped behind the frenetic speed set by Lamingtons and Day Procedure with Boss peeling to the outside just before the home turn. Shamexpress, the $2.50 favourite, exploded to the front with Boss being very kind to this son of O’Reilly as he coasted to a one length win over Day Procedure, $2.80, with one and three-quarter lengths to Flamberge, $6.50, third. While Shamexpress has won just two races, O’Brien has no doubt the colt belongs at the elite level, especially over the sprint journeys. “He is a Group 1 performer. His run in the Coolmore was terrific and that’s where he will end up - in Group 1s,” O’Brien said. O’Brien noted that Shamexpress may have more quality and upside than Adamantium. “We have just worked him out. 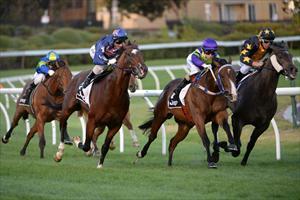 If not this autumn, in the next 12 months you are going to see a pretty smart horse,” he said. Shamexpress provided the second leg of a double for O’Brien who teamed with Craig Newitt to win the Aquanas Foods Premium with in-form mare Hidden Message.